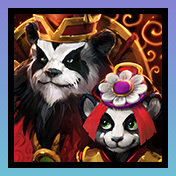 What’s more, players who log in and play 10 games of Heroes of the Storm between January 27 and March 3, 2015 will receive a special new Lunar Festival portrait! Matches played in any mode except for Custom Games will count towards unlocking this epic portrait, so make sure to jump into the Nexus for a brawl before the event comes to an end. The following Lunar Festival Items are now Available Now in the Heroes Shop!